You may reserve your tickets by submitting the form on the left. (Tickets must be collected and paid for in CASH on the eve of the show you wish to watch by 6.30pm). You will receive a confirmation code as well as the password for our online e-souvenir program featuring the project's show pieces once your reservations have been processed and confirmed. 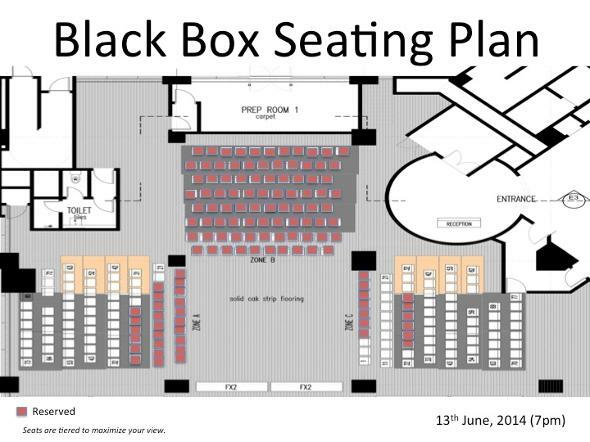 Seating is tiered and there will be use of strobe lighting and loud music during the show. This show is also choreographed "in-the-round" which means all three zones have good visibility. However, Zone B has the best visibility for our showcase videos on-screen. Can't see? Please download a sharper image of the seating plan on the left. Seating plans are updated daily - seats marked in RED are no longer available. Thank you.